Finally, a commercial that has enough bravado to take on the iPhone. I'm surprised we haven't seen these types of commercials sooner. The earliest commercials I can remember are those PC vs. Mac spots. I came across this commercial thanks to Will Burns at Ideasicle, and there is quite a conversation going on as to whether or not it was effective on their Facebook page. 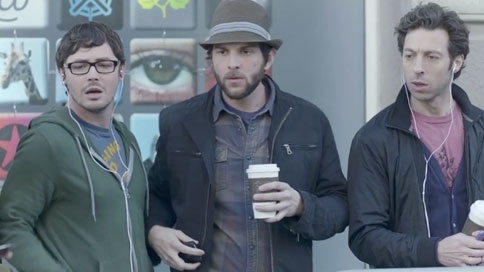 The commercial, produced by 72andsunny, features what Samsung sees as "typical iPhone users" waiting in an endless line for the newest iPhone, as others walk by and show off their new Samsung phone with its bigger screen, and 4G technology. These mocha drinking hipsters don't really know what to do with themselves as talk of this new phone seems to be stealing the show. I personally find those long lines just a byproduct of brilliant marketing. Yes, I have an iPhone, but nothing on it is any different than what I've had since 2007. When Nokia was in its prime, my N95 had a 5 mega pixel camera, 3G technology, Maps, Video Chat functionality, multimedia messaging and much more. If it wasn't for poor execution, they would still be in the smartphone craze we are in right now. On the other hand, these are all marketed as "new" features on the iPhone. This alone shows us how far behind the U.S. really is in the mobile market. The only thing that makes the iPhone what it is are the apps, and nothing more. Well, I'll include the fact that the people at Apple know how to make an elegant looking phone, but even with the iPhone 4, you spend half the time wiping away the damn smudges you get on the all glass display. The thing I like about this approach is that it shows us that there are other options, and they might EVEN be better believe it or not. I don't know if you remember, but I certainly remember the days when all of us had a different phones, and just the thought of seeing another phone spiked our curiosity as to what new phone it was. Nowadays, it's just iPhone's wherever you look. Unfortunately, Steve Jobs did a great job in building a following, which makes it so hard to switch to anything else. As always, leave your thoughts in the comment section below, or join the conversation on our Facebook page.